Installing a dimmer switch is a great way to save energy and create a relaxing mood in a living room, dining room, or bedroom. Size. Dimmer switches are larger than conventional light switches. Unless you have enough room in the receptacle (the electrical box containing the wires), you may not be able to install one. Specifics. Dimmer switches are not universal. Purchase the right dimmer for your light. In this example, a Lutron Skylark Contour C-L Dimmer is used because the Lithonia LED Gimbal recessed light is approved for this dimmer. Instructions. Consult dimmer instructions as your primary source, with this guide as a supplement. I once blew out an expensive dimmer switch because I did not read the product's instruction sheet. Dimmers are more sensitive than conventional switches. Manual Screwdriver: Phillips and flat-head. Cordless Drill: With Phillips and flat-head bits. Find the circuit breaker for the light and flip it off. Some homeowners replace a light by turning off the light switch only--without turning off power at the circuit breaker. Even though this is foolish, dangerous practice, it works because turning off power at the light switch is no different than turning it off at the circuit breaker (please don't ever do this). But you cannot replace your switch without turning off the circuit breaker because power is always flowing to the light switch. Your switch is the dam in the river. But the river is always there. With your manual flat-head screwdriver, carefully remove the two short machine screws holding the outer switch plate to the existing switch. I say "careful" because, if you plan to reuse that switch plate, you will need those screws again--and they are notoriously easy to damage. Switch to your cordless screwdriver/drill. Add a Phillips bit to the tool. Lean into it a little and unscrew the machine screws holding the old light switch to the receptacle box. I say to lean into it because light switches are often tightly screwed into place. Without using enough force, you might strip the heads of the old machine screws, making it difficult to remove the switch. Turn on your voltage tester. Locate a power cord to an appliance or light that you know is working. Hold the voltage tester to the side of the working cord so that it beeps, flashes, or otherwise indicates that power is flowing--and that it is working. Now, put your voltage tester to real use. Slowly pull out the existing light switch, so that it is a few inches out and still attached to its wires. With the voltage tester still on, touch the end of the tester to the black wire extending from the receptacle to the light switch. Your tester should indicate that this wire is not live. 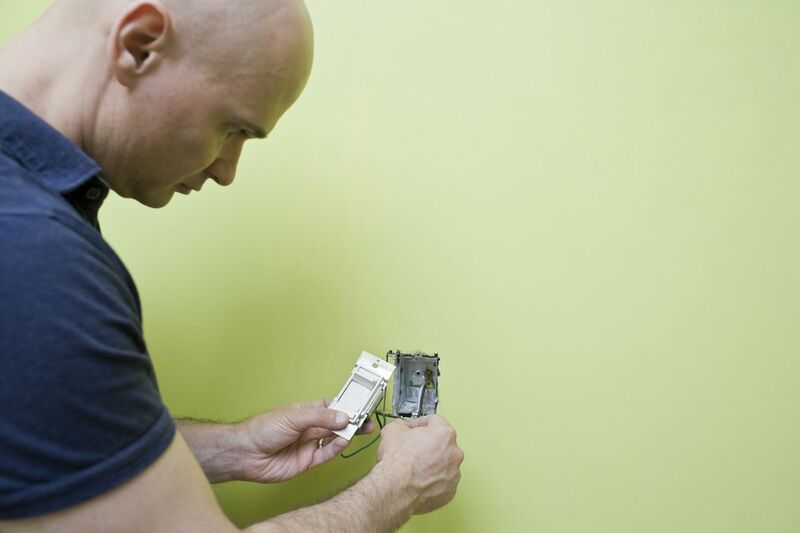 To be certain, touch the voltage tester to various other wires leading to the light switch. Use either manual or cordless, and either flat-head or Phillips, to unscrew the light switch screws holding the wires on. With these screws, it's really a toss-up as to whether flat-head or Phillips work best. As far as the choice between manual or cordless, that's your decision--either will work well. Black is attached to black. Red is attached to black. Green is attached to the ground wire, which may be either bare copper wire or a green wire. Twist a wire nut around each one. As this is a single-pole installation, the red/white striped wire coming from the dimmer is not needed. Cap off this single wire with a wire nut. As wire nuts tend to come off of single wires, twist a short length of electrical tape around the wire nut and wire to keep them together. Putting the dimmer switch back into the electrical box may be difficult, due to the mass of wires inside the box and the size of the dimmer switch's back. Make sure that you have properly folded over the wires and gently put them back into the box. Screw the dimmer switch onto the electrical box. The screws will help to nudge the dimmer switch deeper into the box. Make sure the dimmer switch is completely flush with the outer edge of the box. Go to the service panel and flip the circuit breaker back on. Return to the dimmer switch and turn it on.